The tagline behind the Toshiba Tecra R940 is designed to be a serious business laptop. More recently, this is an area where Ultrabooks such as the Asus Zenbook Prime UX31A, Lenovo ThinkPad X1 Carbon and Samsung Series 9 have been making waves, with their long battery life and speedy solid-state drives. For the most part, though, Ultrabooks tend to be light on features, and if there's one thing the Tecra R940-1CW has, it's business features. A fingerprint scanner, Intel WiDi, a ThinkPad-style pointer as well as a trackpad, eSATA, an Express Card slot, a self-encrypting hard drive and an Intel vPro CPU, offering embedded security features, are all present here. These features are well beyond what the average home user needs, but as we said, this isn't intended to be a home laptop. Outside of the serious business checklist, you get some specs that are a little more mainstream. The screen is a 14-inch, 16:9 aspect ratio affair, with a resolution of 1366 x 768. This is the sort of screen we'd actually expect to see on a home laptop, really, which we'll go into on the next page. The Toshiba Tecra R940-1CW is powered by a dual-core Intel Core i5 processor, with Intel's latest Ivy Bridge integrated graphics providing the grunt for the display. That's all backed up by 4GB of RAM. When it comes to storage, you get a 500GB hard drive, which spins at 7200rpm. This should make retrieving files slightly faster than with the 5400rpm drives you usually get in laptops, but won't offer the same performance as an SSD. You also get a DVD drive - something increasingly uncommon in thin and light laptops. It's packed with all sorts of connectivity options too, as you might expect. An RJ45 Ethernet connection offers wired internet access, and there are two USB 3.0 ports, a multi-card reader, and VGA and DisplayPort video outputs. There's no HDMI connectivity, though. When it comes to wireless, you're pretty well covered too, with Bluetooth 4.0, Wi-Fi and even 3G mobile broadband capabilities (no 4G here, though). All of these features don't come cheap, though. 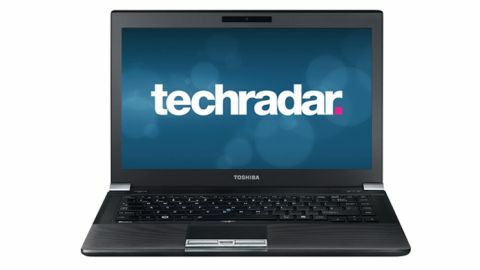 The Toshiba Tecra R940-1CW will set you back around £1,250 (around AU$1,907/US$1,992). That's as much as a fairly high-end Ultrabook (which would be lighter) or a high-performance home laptop, and is the second-most expensive model in the Toshiba Tecra R940 series. Initially, the Toshiba Tecra R940 does feel like it could be a premium machine. At 2kg (4.4lbs), it certainly isn't light for a 14-inch machine, but it's made out of grooved matt plastic that feels like it could be body armour for a SWAT team. When closed, the Toshiba Tecra R940-1CW feels solid and durable. It still feels sturdy overall when opened, but we did have some build issues with the inside, which we'll go into on the Performance page of this review. At 341 x 239 x 27.4mm, this simply isn't going to go unnoticed in your bag, the way a MacBook Air might, but it's clear that Toshiba has managed to fit a lot into the available space.